Plum Magic™ Crapemyrtle is a miniature crapemyrtle that blooms in early Summer. It has abundant fuchsia-pink flowers on its rounded, dense habit. The foliage emerges as a beautiful plum-purple color and matures into a rich dark green shade that exquisitely complements the fuchsia-pink blooms. 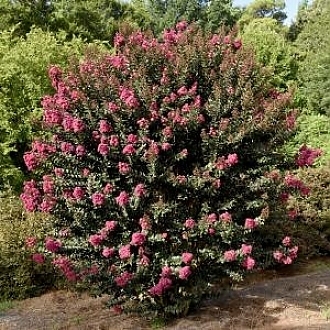 This crapemyrtle will re-bloom in late Summer if the first flush of flowers are deadheaded. As with all of the Crapemyrtles in the magic series, it has excellent resistance to leaf spot and powdery mildew.